Coming to the Metropolitan Opera Guild for a Community Programs event, or to rent a score, or on business? The Metropolitan Opera Guild is located on the 6th Floor of the Samuel B. & David Rose Building, 70 Lincoln Center Plaza (on the north side of W. 65th Street, between Broadway and Amsterdam Avenue). 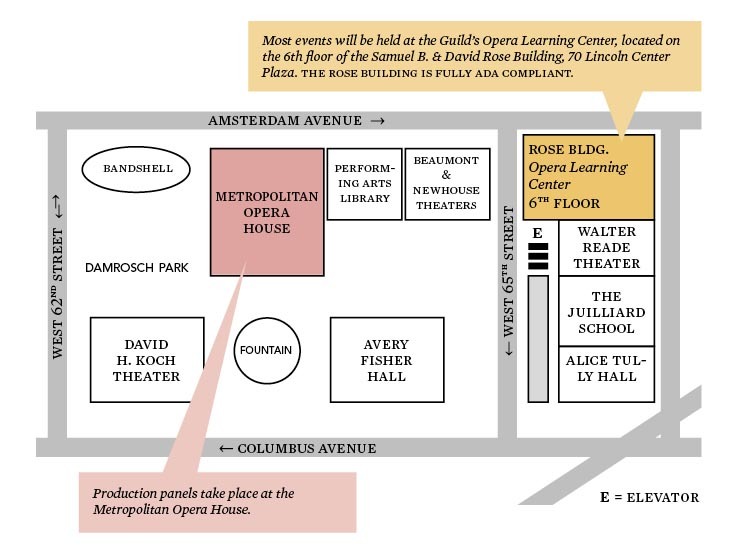 The Rose Building lobby is on the 3rd Floor, and can be accessed in three ways: via the stairwell adjacent to Juilliard's Peter J. Sharp Theater; via the escalators that are fifteen yards west of the parking-garage entrance on 65th; or via the glass bridge spanning 65th Street. When no longer on street-level, the entrance to the Rose Building is just past the Film Society's ticketing window at the end of the outdoor corridor, on the western side of the building. Pick-Up/Drop-Off: On the North side of West 65th Street near Amsterdam Avenue. Accessible Entry: There is elevator and escalator access from street level to Plaza level, located on the north side of West 65th Street near Amsterdam Avenue, adjacent to the security guard box. Enter the Rose Building through automated doors operated by a button on the left-hand side of the entrance. The Opera Learning Center is accessible from elevators inside the lobby. Accessible Seating: Wheelchair locations and designated aisle seats are available upon request. Please specify your accessible seating requests when purchasing tickets or booking your venue to ensure accommodations. Restrooms: Accessible restrooms are located on the 6th floor near our Opera Learning Center. Water fountain: The fountain is located in a recessed space in the hallway leading to the Opera Learning Center on the 6th Floor. Please call 212-769-7028 at least 24 hours prior to the event to arrange for any special assistance.